We had my parents and my sister over for Thanksgiving this year, My husband is an amazing cook, and always manages to get the turkey beautifully roasted and tender despite never defrosting the bird until the night before. He manages to make side dishes that everyone can enjoy, and includes options that appeal to our low-carb high-fat lifestyle alongside other more traditional offerings. When I offer to help, he says that he just wants me to sit there and be beautiful. Do you have any questions about why I married this man? But one thing I do insist on is making the appetizers. I love the detail and intensity of creating tasty little single-bite snacks that people can munch on while anticipating the great meal to come. And since appetizers have no limitations, you can convince even the most ardent high-carb low-fat dieter to try just one. 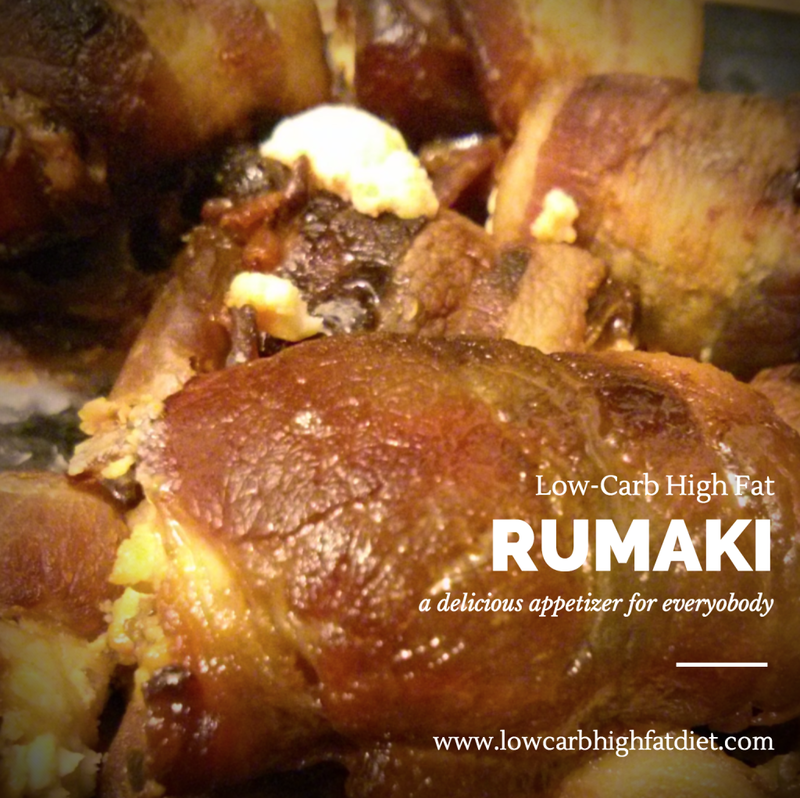 We’re a bacon household, and one of my all-time favorite appetizer recipes is a very simple low-carb high-fat rumaki. If you’re not familiar with rumaki, think back to your parents (or grandparents) entertaining their friends over cocktails and cheese fondue back in the mid-twentieth century. Picture print skirts and big hair, cigarettes indoors, men in gray flannel, and bright pink and green wallpaper. Rumaki is a throwback to a time when the tales of nuclear testing on native islands translated in popular culture to the two-piece bikini. To make a typical rumaki, you take bacon, roll it around dates stuffed with almonds and cream cheese, and broil them until they become a sticky sweet finger food. Serve them up on a platter and watch them disappear. Of course, on a low-carb high-fat diet, the dates need to go. But it’s not all that easy to come up with a suitable replacement. I’ve had success with marinated mushrooms, and less success with attempts to just go straight to the cheese. You need a container for the creamy filling that will stand up to the broiling, delivering a complementary flavor. After a lot of trial and error, one surprising solution turned out to be asparagus. If you split asparagus stalks and fill them with cream cheese, and then wrap them in bacon, you can turn out a pretty amazing rumaki. The final result is a little crisp, has a good mouth feel, and the natural sweetness of the asparagus comes through just enough to create a delicious combination. If you haven’t tried rumaki before, you have no idea how attached you are going to become to this tasty retro treat. Invite me over the next time you make some, or at least send me a picture. I can never get enough of these!